• 8 MHz Bi-directional Doppler with the same optimal beam shape and sensitivity as our non-directional LifeDop 8 MHz, one of the most advanced probes for audibly identifying tri-phasic flow. • Fast Bi-directional waveform printing on a rechargeable battery powered printer. Complete printout takes only 10 seconds compared to over 60 seconds for some competitor’s units. • Printer is compact, durable, battery-powered, and easily transportable. Includes belt clip. • Special peel and stick label paper saves time when preparing the patient record. No need for cutting and taping. Printed waveform attaches to formatted report form. 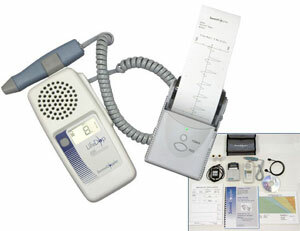 • Doppler waveform is continually buffered in the LifeDop’s memory during the exam. With a simple button press, the previous four seconds of Doppler waveform is automatically sent to the printer. No need to worry about losing the vessel while printing. • Automatic waveform scaling is provided. No need to repeat tests due to “clipped” or tiny waveforms. • Calibration is automatic. Unlike some units, there is no need for a “calibration pulse” that wastes time and paper. • Paper loading is fast, easy, and error free. • LifeDop display includes a signal bar to indicate flow direction and a battery life indicator. 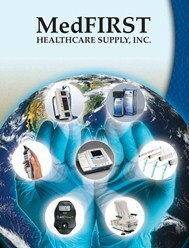 • The LifeDop Doppler can be used with or without the printer unit. The buffered waveform is buffered in the LifeDop memory and will automatically print once connection with the printer is established. • The LifeDop unit can display a full range of Error Diagnostics including printer status. L250AB - Reimbursable vascular doppler with portable printer, 8MHz Bi-Directional probe 2 cuffs and aneroid. L250AC - Reimbursable vascular doppler with portable printer, 8MHz Bi-Directional probe, 4 cuffs and aneroid.